As sexual abuse of women continues to dominate national news in the United States, a scientific session presented today at the RSNA annual meeting about the clues diagnostic images can provide could not be more timely. A study conducted at Brigham and Women’s Hospital which reviewed electronic medical records (EMRs) of patients referred to domestic abuse and sexual assault programs over a 10 month period in 2016 identified characteristic injuries among the patients. Intimate partner violence and sexual assault are believed to be under-recognized by radiologists reading studies of patients who are admitted to hospital emergency departments. However, 25% of women in the United States are believed to experience physical abuse or sexual assault by their intimate partner. The Brigham and Women’s Hospital study analyzed the demographics, clinical presentation, and radiologic findings of patients presenting as victims of domestic abuse and sexual assault. Session presenter and radiology resident Elizabeth George, MD, stated that common patterns of injury were identified in a study cohort of 35 sexual assault victims and 87 patients who experienced intimate partner violence. Injuries included soft tissue injuries and extremities, often involving the distal upper extremities. Dr. George said that these types of injuries suggested defensive attempts by the patient. 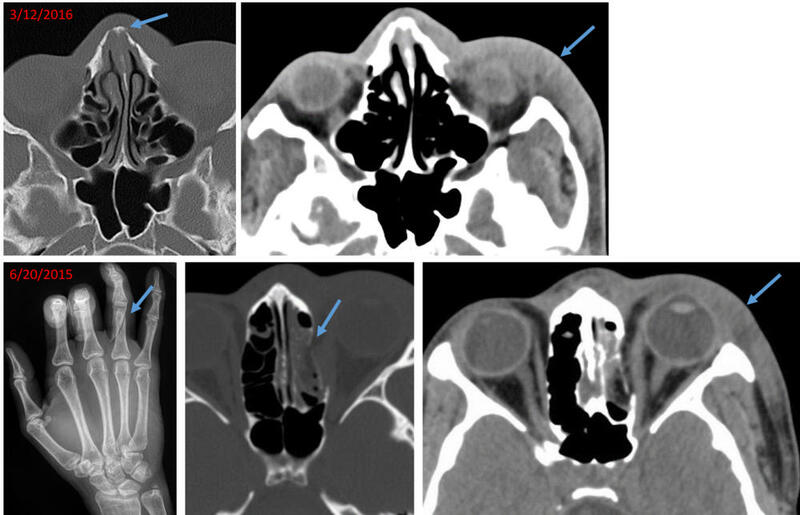 Other commonly seen injuries were facial fractures, which represent an easily accessible area for inflicting trauma. 91% of the 35 sexual assault patients were women, with a mean age of 27.3 years. 46% were African-American. The traumatic injuries identified among these patients included orbital wall deformity, a spinal compression fracture, and soft tissue swelling. The most commonly performed imaging exams were chest X-rays, followed by head CT scan, pelvic ultrasound, and musculoskeletal radiographs. The patients’ EMRs showed that a total of 109 radiology exams had been performed in the sexual assault cohort over a five-year period of time. 95% of the intimate partner violence patients were women, with a mean age of 34.7 years. 40% were African American. 83% of the patients had a prior clinical history of experiencing violence. A total of 665 radiology exams had been performed over a five-year period; one patient alone had 65 imaging exams. The most commonly performed exam was chest X-ray, followed by obstetric ultrasound, and musculoskeletal radiographs. The most common traumatic injuries were extremity fractures, nasal bone fractures, orbital fractures, soft tissue injury such as hematomas and/or lacerations, and spinal fracture/compression. Dr. George reported that other findings potentially related to violence were subchorionic hematoma, pregnancy failure, and intrauterine growth retardation. Principal investigator Bharti Khurana, MD, director of the emergency radiology fellowship program at Brigham and Women’s Hospital, pointed out that in addition to providing information about new injuries identified by diagnostic imaging, digital archives in a PACS can provide a wealth of information for a radiologist for a radiologist to review. Prior fractures can be linked to abuse. “Old, healed fractures look distinct from acute fractures, and may be evident in the form of bone remodeling, deformity, or focal bone thickening,” she said. “In the emergency room setting, the priority is to identify acute pathologies. As a result, old fractures or fracture-related deformities may not be given sufficient importance. But the presence of old and acute fractures may be pivotal in making the diagnosis of intimate partner violence,” said Dr. Khurana. Both Dr. George and Dr. Khurana recommended that if a radiologist identifies any findings suggested of abuse, he/she discuss this with the referring physician. Of particular interest: Dr. Khurana decided to undertake the study while reading a study of a young woman who presented at the hospital emergency department with an acute nasal bone fracture superimposed on an old, healed fracture. While reviewing the patient’s prior imaging exams on PACS, she identified a recent wrist fracture. Dr. Khurana reported this to the referring emergency physician and advised that she suspected intimate partner violence. The referring physician had not suspected this at all. Dr. Khurana and Dr. George discuss the case in a video which may be accessed here. RSNA 2017: Diagnostic images can help identify sexual assault and domestic abuse. Appl Radiol.